There’s nothing fishy about the benefits of taking fish oil. Fish oil has long been regarded for its many health benefits. Most notably, the omega-3 polyunsaturated fatty acids (PUFAs) in fish oil have been shown to have anti-inflammatory properties that enhance cardiovascular health.3 Omega-3 fatty acid supplementation has also been shown to enhance fetal cognitive development.4 In addition to these benefits, it seems omega-3 fatty acid supplementation during pregnancy may play a role in childhood allergy risk as well. The meta-analysis from the current study showed an association between omega-3 fatty acid supplementation using fish oil during pregnancy/lactation and reduced allergic sensitization to egg at 1 year old.2 These results were from pregnant women who took a daily fish oil capsule from 20 weeks gestation to the third or fourth month of breastfeeding.1 The risk of egg allergy in the child with this maternal supplementation was reduced by 30 percent.1 In addition, the team found that women taking fish oil supplements during pregnancy reduced the child’s risk of peanut allergy by 38 percent.1 The reduction of certain child allergies from fish oil is likely attributed to the anti-inflammatory effects of omega-3 fatty acids. 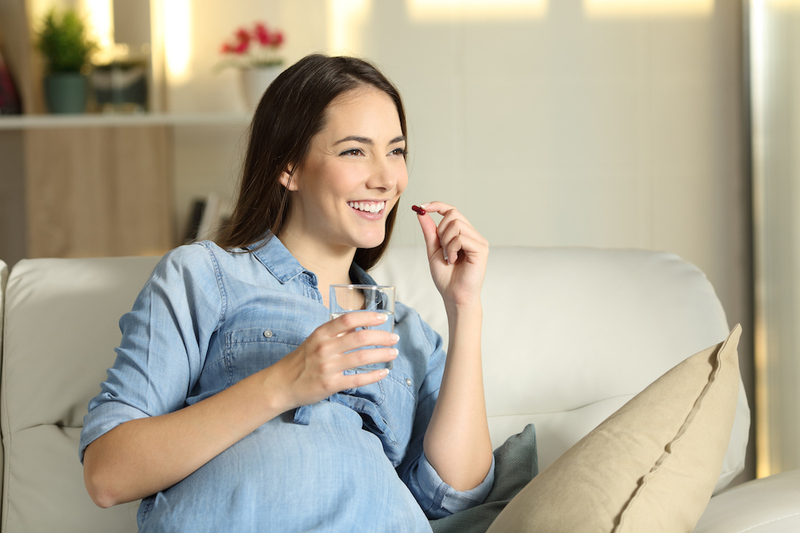 This study illustrates the potential benefits of omega-3 fatty acid and probiotic maternal supplementation in reducing child allergy risk. As you continue on your pregnancy journey, it is important to remain aware of new research that comes to light and follow the most current pregnancy guidelines. It is important to speak to your healthcare provider with any questions or inquiries about prenatal nutrition that you may have. References: 1. Imperial College London. “Fish oil and probiotic supplements in pregnancy may reduce risk of childhood allergies.” ScienceDaily. ScienceDaily, 28 February 2018. www.sciencedaily.com/releases/2018/02/180228144448.htm. 2. Garcia-Larsen V, Ierodiakonou D, Jarrold K, Cunha S, Chivinge J, Robinson Z, et al. Diet during pregnancy and infancy and risk of allergic or autoimmune disease: A systematic review and meta-analysis. PLOS Medicine, 2018; 15 (2): e1002507 DOI: 10.1371/journal.pmed.1002507. 3. Mayo Clinic. Omega-3 in fish: How eating fish helps your heart. Mayo Clinic Staff. July 20, 2016. Website. https://www.mayoclinic.org/diseases-conditions/heart-disease/in-depth/omega-3/art- 20045614?pg=2. 4. Carlson S. Docosahexaenoic acid supplementation in pregnancy and lactation. Am J Clin Nutr. 2009; 89(Suppl):678–684. 5. Cho, I., & Blaser, M. J. (2012). The Human Microbiome: at the interface of health and disease. Nature Reviews. Genetics, 13(4), 260–270. http://doi.org/10.1038/nrg3182.